A 72 year-old woman with a past medical history of hypertension and hypercholesterolemia presented with a several month history of multiple strokes.� All causes of her strokes were ruled out, including infection and a hypercoagulable state. �Numerous head CTs and MRIs revealed diffuse periventricular white matter change, thought to be chronic microvascular infarction.� The patient�s mental status did not improve and a brain biopsy was ultimately performed. 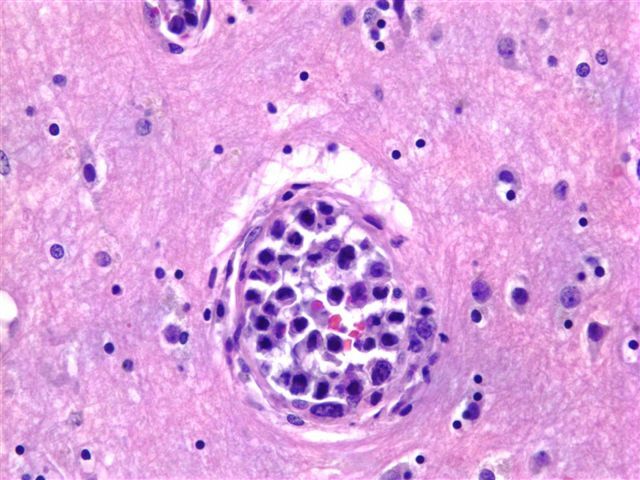 The brain biopsy consisted of cortical gray and white matter with penetrating capillaries and arterioles containing large atypical cells (image1, image2).� The cells were dyscohesive with irregular nuclear contours and one to several prominent nucleoli (image3). The cells were immunoreactive for leukocyte common antigen/CD45, CD20 (image4) and CD79a, and were negative for cytokeratins and HMB-45. 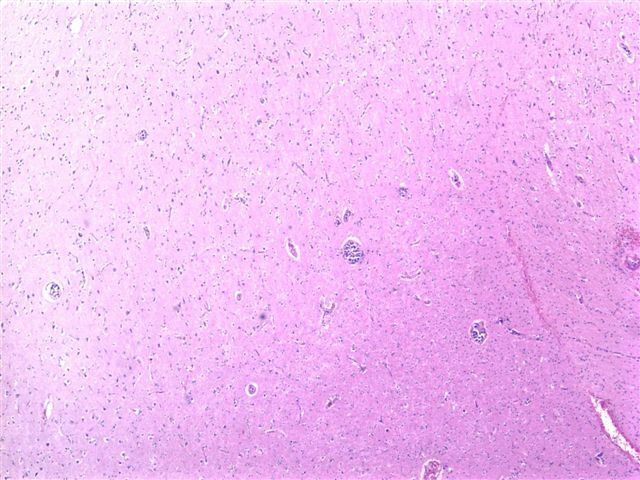 Intravascular lymphoma is a rare subtype of diffuse large B cell lymphoma, with intravascular growth in the skin, CNS, and other sites.� The presenting signs and symptoms are often complex, and include mental status changes, as in this case, and rapidly progressive dementia.� Patients may present with a mass lesion (Pathol Int 2004;54:231), a skin rash or fever of unknown origin. 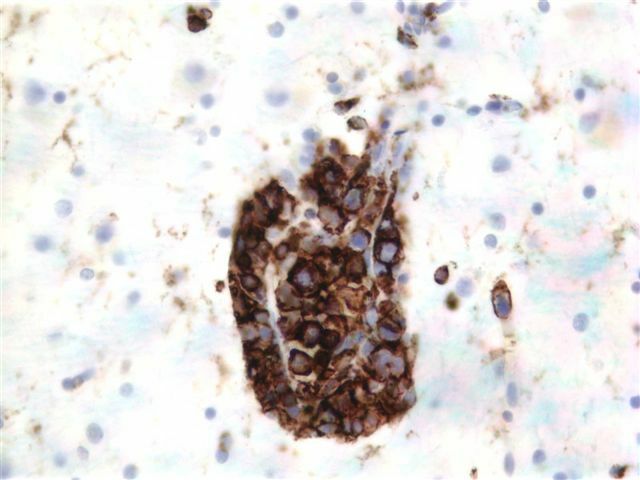 Patients are typically elderly, with a median age of 71 years.� Although chemotherapy may be effective (Ann Oncol 2004;15:1215), these tumors are often not diagnosed until autopsy, which typically shows involvement of most organs.� In this case, the patient was 72 years old, and expired two weeks after the brain biopsy.� A post-mortem examination revealed widespread disease, with involvement of the heart, lung, kidneys, adrenals, stomach, pancreas and spleen.� No skin lesions were found. 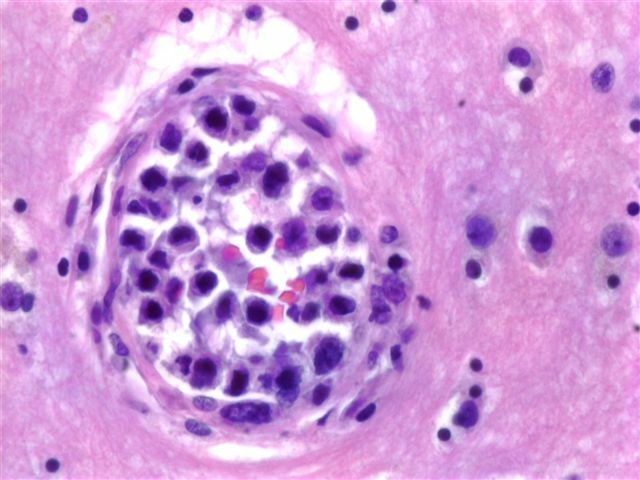 Histologically, the tumor is composed of large centroblast-like lymphoid cells with prominent nucleoli within small vessel lumina, often capillaries.� Mitotic figures are frequent, and there are often fibrin thrombi.� Immunohistochemistry results are similar to diffuse large B cell lymphoma, with immunoreactivity for CD19, CD20, CD22 and� CD79a.� Tumors are usually bcl2 positive.� Rarely, these tumors are T cell lymphomas with corresponding immunoreactivity.